A few days ago, PayPal introduced a new feature for Android Phones, that enables users to simply hold their smartphones together and wait for a buzz initiating a money transfer between the two users. The system works currently only with Samsung’s Nexus S phones that contain Near Field Communication chips. Near Field Communication is a wireless technology that enables devices to exchange information – including encrypted payment data – over a short distance. It can enable a consumer to pay for goods in a store by waving a smartphone with an NFC chip near an NFC-enabled terminal. To use the new person-to-person payment service, one PayPal user sends a request for a payment to another PayPal user from within a PayPal widget on their smartphone. I’m curious when I can go to the next grocery store and pay with my phone like this! The last days and weeks, there has been lots of coverage about Google+ features like Circles, Sparks and Hangouts, but there wasn’t that much talk about the Google Check-ins. This features shows up in the mobile app and allows you to check in by attaching your location to a status update. The advantage of Google Check-ins is that it tightly integrates with your Circles to share your checkins with only the people you want to see them. This offers a much more nuanced approach to privacy than services like Foursquare or Facebook are able to offer. If you want to try Google+ for your Android, but you cannot find the App in the Market repository, you can search for the APK file in the web and install manually. This shall work without any problems. Macht Google+ Nun Auch Foursquare Konkurrenz? In den letzten Tagen und Wochen wurde viel über Google+ und Features wie Circles, Sparks und Hangouts diskutiert – über ortsbezogene Dienste hingegen wurde kaum geredet. Zu unrecht, denn Google+ bietet auch eine Check-In Funktion wie bei Foursquare oder Facebook. Damit haben Nutzer die Möglichkeit ihrem Status-Update eine Position etc. hinzuzufügen. Das sinnvolle an der Sache ist, dass man Check-Ins nicht mit der ganzen Welt teilt, sondern nur mit bestimmten, vordefinierten Personenkreisen, den Circles. Damit hat Google+ in Sachen Privatsphäre auch bei ortsbezogenen Diensten die Nase vorn. Denn gerade bei den Check-Ins möchte man doch die Kontrolle über die Privatsphäre behalten, oder nicht? Wenn Sie Google+ nicht im Android-Markt finden können, suchen Sie einfach im Internet nach der richtigen APK-Datei und installieren Sie es manuell – das sollte problemlos funktionieren. Is Your Business Prepared for Mobile Devices? According to a report by direct digital marketing software and services provider Knotice, emails from retailers and financial services companies are opened on mobile devices more frequently than any other sector. 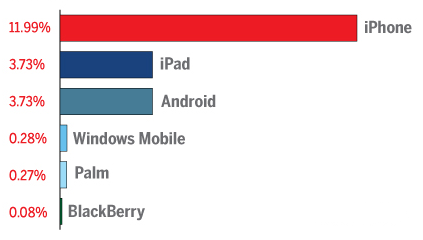 Six mobile device operating systems contributed to the 20.08 percent of retail e-mail opened on the go: the iPhone, the iPad, devices using the Android operating system, devices using the Windows Mobile or Windows Phone 7 operating systems, Palm, and Black Berry. Knotice studied a sample of 153.5 million Q4 2010 e-mails from 12 industries. Ist Ihr Geschäft Fit Für Mobile Endgeräte? In keinem anderen Sektor werden E-Mails so häufig auf mobilen Endgeräten geöffnet wie im Einzelhandel und Finanzsektor. Laut einer Studie von Knotice wuden im 4. Quartal 2010 20.08 Prozent aller einzelhandelsbezogenen Emails auf mobilen Endgeräten geöffnet. Die Studie bezieht sich auf eine Stichprobe von 153.5 Millionen Email aus 12 verschiedenen Branchen: iPhone und iPad liegen klar vorne, gefolgt vom Android-Betriebssystem. Geräte mit Windows Mobile oder Windows Mobile 7 sowie Palm und Black Berry belegen Platz 4 bis 6.